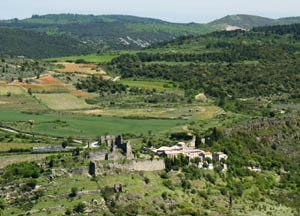 Sited above the Sals River (so called because of its salty water) it controlled the Sals Valley in the modern Aude département and thus the only significant route between the Aude Valley and the Corbières. 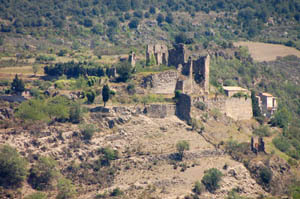 Just across the Sals valley is Rennes-le-Château. 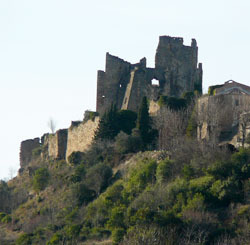 The original castle was built by the Trencavels - Viscounts of the Razès - in the twelfth century. 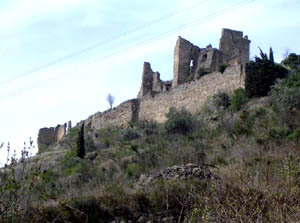 Later in the twelfth century, the lordship of Coustaussa belonged to the Vilar family. 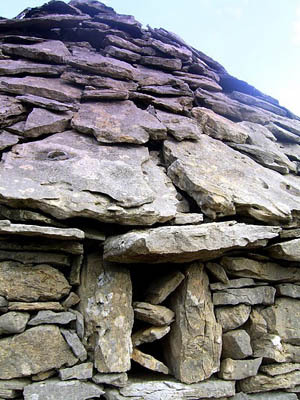 Soon after, it was in the hands of the de Fenouillet family. 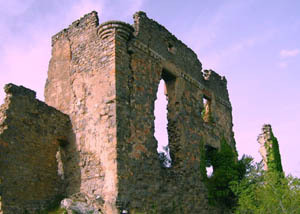 In 1367, by the marriage of Geraude de Fenouillet to Saix de Montesquieu, the lordship passed to the Montesquieus who kept it until the French Revolution. 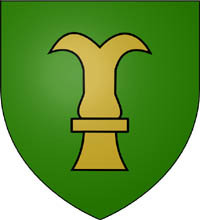 Like many other strongholds Coustaussa returned to its traditional allegiance the following year. According to the Historia Albigensis , Simon de Montfort was at Narbonne with a crowd of newly arrived Crusaders when he heard the news. He immediately hurried off to Coustaussa and attacked it. 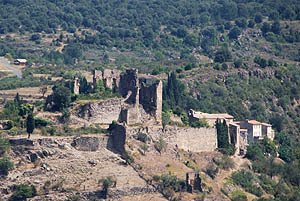 The castle was surrendered after "a few days", after which Simon set off for Castelnaudry. 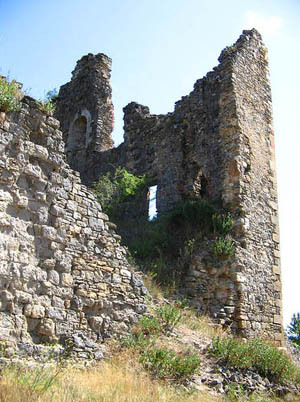 After the Crusades, the Castle came into the possession of the de Montesquieu family. The present Château was apparently still in good shape until the nineteenth century, when an enterprising local realised that he could turn a few Francs by stripping out and selling the woodwork. 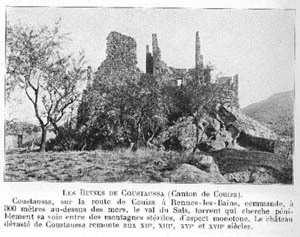 During the night of 31 October to 1 November 1897, the parish priest of Coustaussa, the Abbé Antoine Gélis, was brutally murdered in his presbytery. The crime was not solved. The Abbé was found during the investigation to possess large sums of money which had not been taken by his assailants. 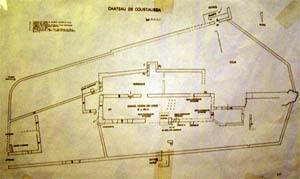 This event has been incorporated into the Rennes-le-Chateau "mystery". 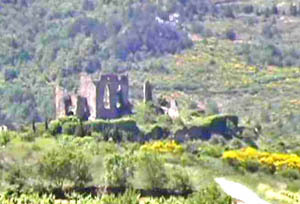 (Rennes-le-Chateau is in sight of Caustaussa across the Salz valley. The Chateau is in a poor state.